Airasia and Airasia X refused to collect the extra airport tax imposed.... they are really making a stand that klia2 is a LCC terminal. Lets get our munchies and watch the sandiwara! All I can say is good luck collecting the extra RM23 from pax after they have purchased their tickets. Stock prices of AAX fell 2% and AK fell ~1.5% due to this pending lawsuit. I feel like they aren't protecting their investors' interest. They won't collect it from pax, they will have to fork it out themselves. What will happen is that they will pay the difference, but at the same time I think govt will reduce the airport tax. Depending on the difference in new airport tax, I feel in the end a win for AirAsia. I read somewhere that they are also roping in Mavcom. Anybody knows currently how does Air Asia handle the airport tax collected from passengers who didn't appear to board their flight ? Auto refund ? Passenger have to write in to ask for refund ? Those who didn't ask for refund will treat as income ? Only once I had a full refund because Air Asia changed the flight time and I decided to opt for refund. In another time, I did not board the flight and I did not get any refund for airport tax despite me submitting a claim for it. 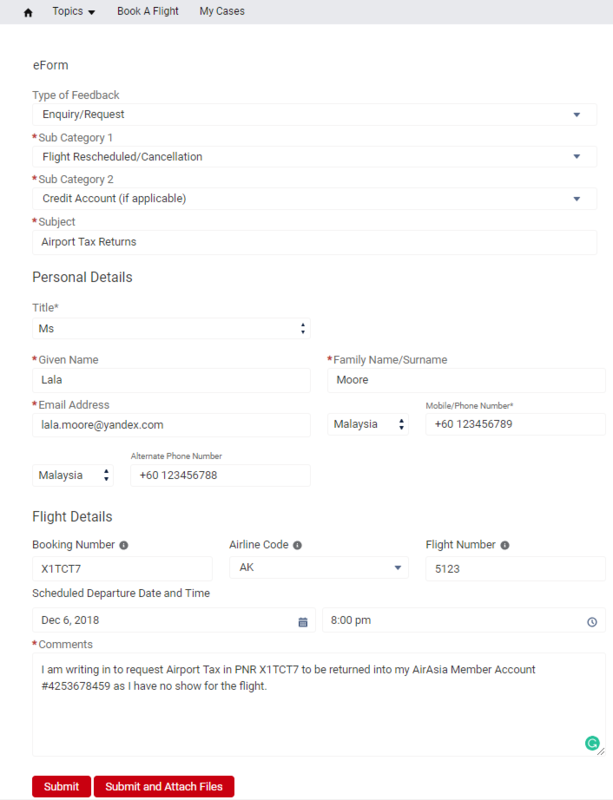 Submit the request in AirAsia.com e-form and periodically follow-up the case in e-form. 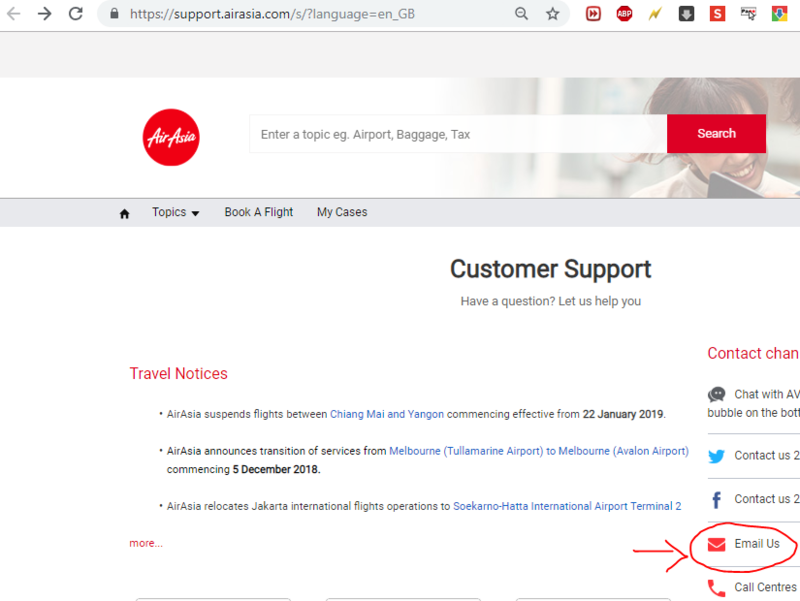 I never fail to submit them and always get my airport tax returned in form of "Credit Account"; AirAsia.com website credit which can be deducted in my next ticket purchase. Do not request to have the airport tax refund into your Bank Account or Credit Card as it will incur Refund Fee which will be deducted from your refundable amount. You are to request the Airport Tax to be returned within 6 months from the date and time of no-show flight. ie: Your no-show flight is 30 June 2018 - AK5122 - 2020DEP - 0030+1ARR, you have to request/send in e-form before 30 December 2018 @ 2020 or else you will not get back your airport tax. *IMPORTANT: Member ID to be credited with Airport Tax must belong to and under Passenger name or Paymaster name. The link below explains what is the website Credit Account and teaches you how to use it. Edited by Adrian M, 16 December 2018 - 12:40 AM. The one you did not get refunded I suspect it could be your airport tax refundable amount is negative amount after deducted with Refund fee since I think you chose to have it refunded to Bank account or Credit Card. To have it credited back to website credit account will spare you from the refund fee. Edited by Adrian M, 16 December 2018 - 12:55 AM. This makes sense. It was for a domestic flight hence no refund. I will ask for refund to Credit Account in future. Thanks for the tips. Looks like the truce is over and now it is all out war! Haha. AirAsia, hero of the people. Without them, Malaysia will have no tourism. 1. Is it MAHB that sets the PSC rate? Or the government? 2. "The additional RM23 to be collected will amount to more than RM100 million a year that will go straight to MAHB’s bottom line rather than to the government" is this true? Or pure fakenews? Should MAHB sue them for this statement too? 3. Do passengers really care about RM23 when your ticket price is ~RM500, and your total traveling expense perhaps double (or triple) that? 4. 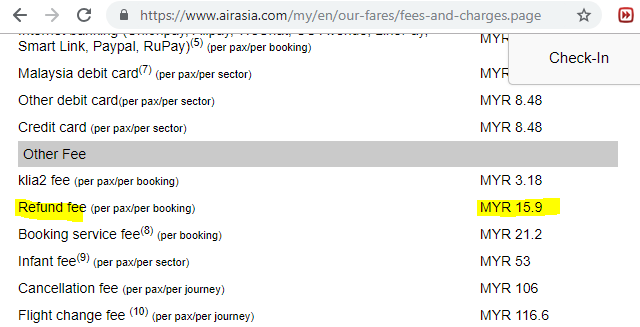 Perhaps AirAsia can help lessen the burden of the people by taking out the RM3 "klia2 fees" that tries to imply MAHB collects when in reality AirAsia collects? 5. What about the multiple methods they charge you for paying with your card, Bank etc? People would appreciate if these costs were absorbed by AirAsia I think? This credit card fee would lead to the collapse of the Malaysian aviation industry. I get more annoyed when these red folks ask me to use Bigpay instead of my credit card. Only useful for the exchange rate nothing else. In few years time probably all payment services and clients in all levels and departments will be under their vendor or partners. Edited by jahur, 20 December 2018 - 12:30 PM. Yes, it used to be free when using bank transfer but now it is RM4! We have to pay them for the privilege of buying from them. Ridiculous!